Looking for basic yellow healthy cupcakes? 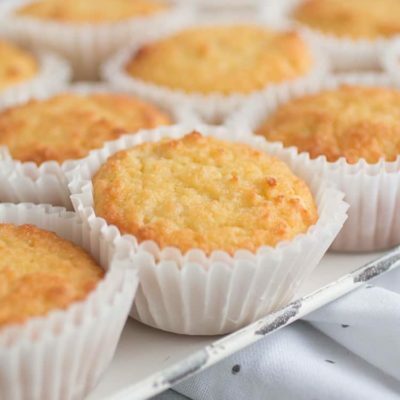 These Sour Cream Vanilla Keto Cupcakes have only 2 net carbs each. They are great plain or with your favorite icing. I also love them with strawberries and whipped cream. Birthday season is coming to our house. It begins with my baby turning 2 on December 30th and continues with everyone else within the next 6 months. Most of my husband’s family also has late winter or spring birthdays. Last week I made a batch of Magnolia Bakery’s famous vanilla cupcakes to freeze for our first party. They are my favorite. But they are not Trim Healthy Mama compatible (not even a smidge). I was strong that morning and didn’t even lick the mixing spoon. I don’t know if I can be that strong at the party once they are covered in buttercream icing. I knew that I needed an alternative for myself so the next day I went to work creating one. Here are my sour cream vanilla HEALTHY cupcakes. 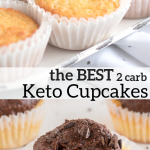 These keto cupcakes are perfect. They are very flavorful I’m thrilled to have a batch in the freezer so I don’t have to miss out at all of our celebrations. 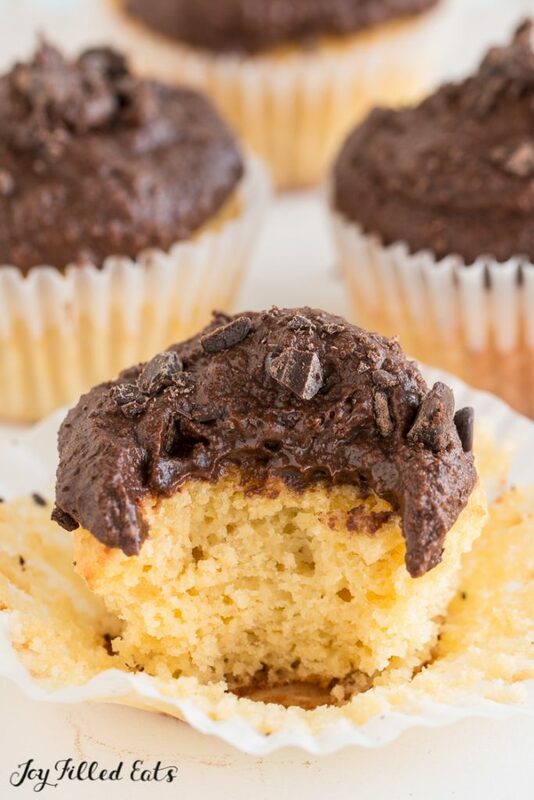 If you have a hand mixer or food processor it is very very easy to make cupcakes! Simply mix together a couple of ingredients. Add a couple more. Mix more. Add more. Mix. And then just scoop into cupcake liners. That’s it! The prep for these takes 15 minutes tops. I think I can get them in the oven in 8 minutes if my kids aren’t helping. If the little ones are helping it probably takes 30. No joke. 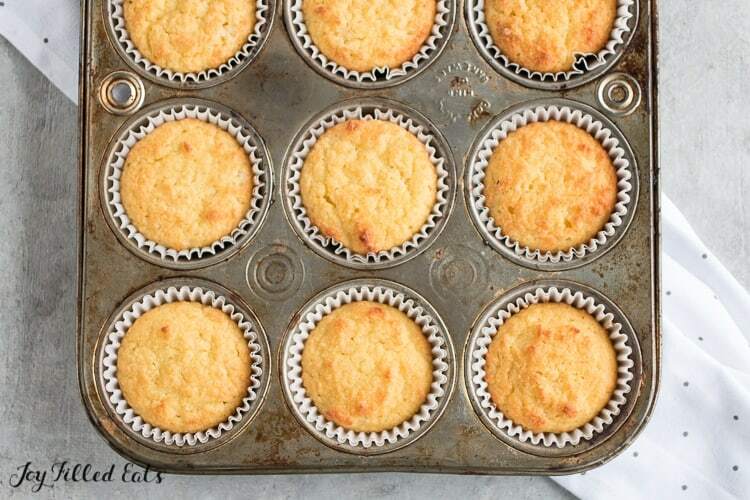 This recipe makes one dozen delicious sour cream vanilla keto cupcakes. 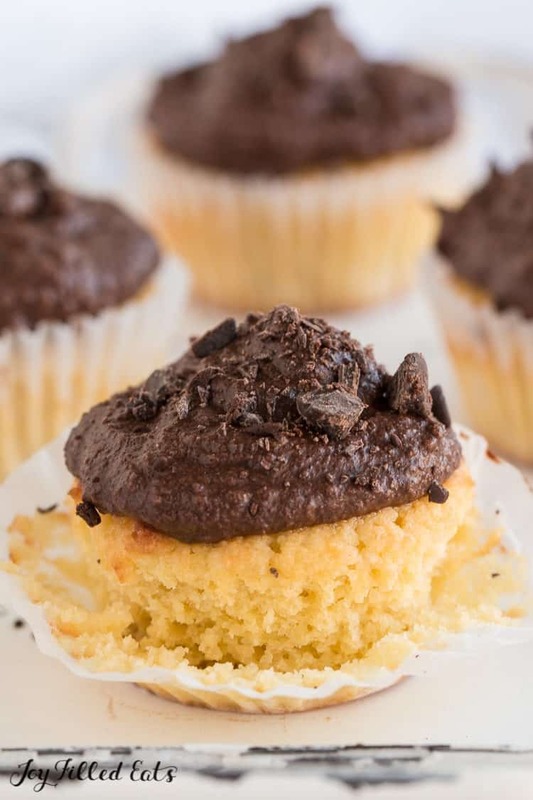 If you need more cupcakes then go ahead and double or triple this recipe. Which icing to use for keto cupcakes? There are dozens and dozens of ways to top these. One of my absolute favorites is with a chocolate frosting. 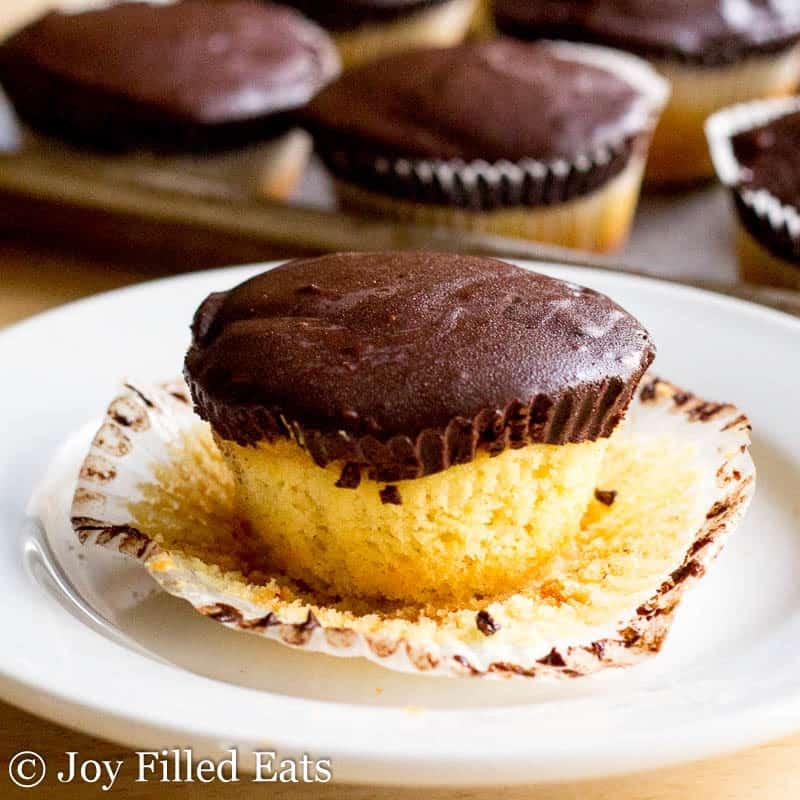 You can see the chocolate frosting used for these cupcakes here. My Raspberry Lemonade Cupcakes are pretty enough for a baby or bridal shower. They are filled with lemon curd, a fresh raspberry, and then topped with Raspberry Buttercream! 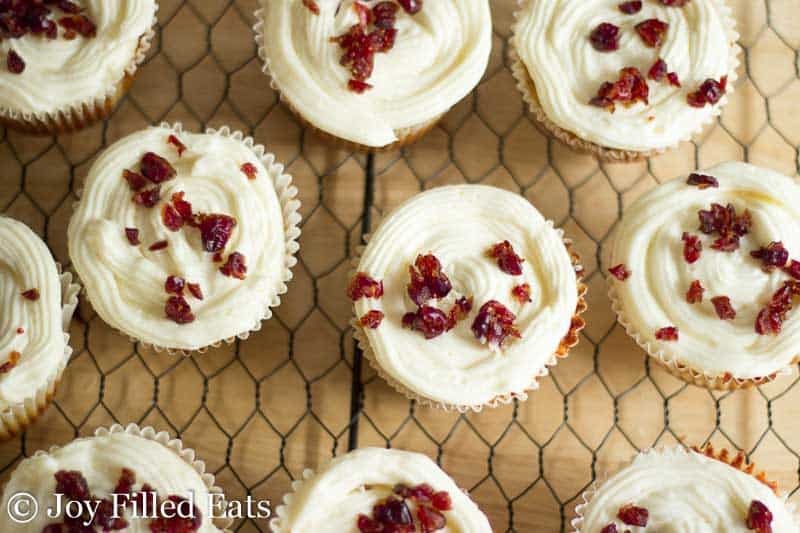 Cranberry Bliss Cupcakes mimic the flavors of the classic Starbucks treat. With a cranberry filling and cream cheese icing, they are the perfect bite. Or turn them into my Tagalong Cupcakes if peanut butter and chocolate are more your thing. 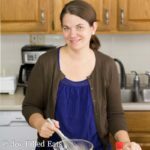 I hope you love these Low Carb Cupcakes! Looking for a basic yellow cupcake? These Sour Cream Vanilla Cupcakes have only 2 net carbs each. They are great plain or with your favorite icing. I also love them with strawberries and whipped cream. In a bowl with an electric mixer cream the butter and sweetener until light and fluffy. Add the sour cream and vanilla and beat until combined. Add the eggs one at a time mixing after each. Stir in the flours, baking powder, and salt until thoroughly combined. Divide batter between 12 muffin cups lined with paper liners. Bake at 350 for 20-25 min. Some ovens will take up to 30. 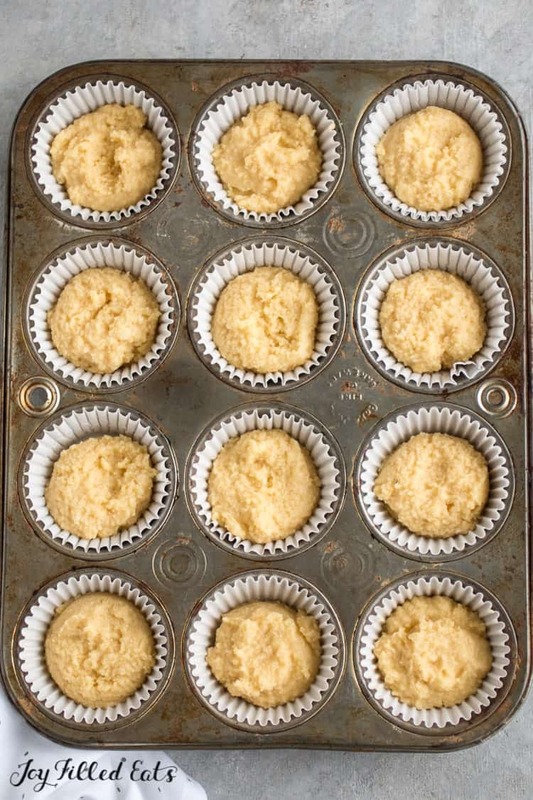 You want the cupcakes to be firm to the touch and golden brown. So I made the recipe to the T... I used swerve as my sweetner, but I think I may have put to much because now it leaves a little after taste in my month for about 2-3 minutes. Either way the smell is amazing and smells just like regular cupcakes. I haven't put any topping on them because I'm trying to get away with eating 2 not just 1. I've been keto for almost a month and needed a sweet treat. I read through the comments half way adding the cupcakes into silicone cups and added the baking soda and heavy cream... I definitely like that addition. Is the taste supposed to be overwhelmingly sweet or did I put to much sweetner? I wonder if after freezing there would be a different taste? I absolutely love this recipe!! The cupcake is soooo delicious thank you. :) I used Swerve granular and added some splashes of heavy cream with a pinch of baking soda. They’re super moist! Only downside is it sunk in the middle. Which is fine with me because I can fill them with raspberry jam and top them with loads of frosting. I used the convection bake setting on my oven for 15min. Had to add an additional 2 min. Toothpick came out clean after the additional 2 min. I’M SO HAPPY!! how much swerve did you use in the recipe? 1/2 cup of swerve granular. Also I forgot to mention I sifted both flours with the salt and baking soda plus baking powder. Can you post how you make your own combo sweetner mixture? Thanks! Would it be possible to sub organic yogurt for the sour cream? Yes, yogurt should be fine. If I only have stevia, how much should I use? I'm not sure pure stevia will work in this recipe. How can I make these chocolate? You want to make these with regular white sugar? You would use twice as much as my sweetener. Would Lakanto monk fruit sweetener work as a substitute? Yes, I think so, but you will need more. It's not as sweet as the blend I use. Try 1.5 times the amount. These are good, and I'm glad I made them. 30-35 minutes seems like a long time for cupcakes. I took a chance and set my timer for 20 minutes. Mine came out very brown, and could probably cook in 18 minutes. Very good flavor, and I'll definitely make again. How long will they last in the fridge? I made them today (Sunday) and am going camping Thurs to Sat. Curious if I need to freeze them between now and then. A week in the fridge, months in the freezer. Enjoy your trip! I plugged the recipe into MFP and it came up with 10.2g/ 9.1g of carbs. That's a lot different from 3g...I can't seem to figure out what happened. MFP does not subtract sugar alcohol. I subtract sugar alcohol manually with my program when calculating carbs. Hi, looks great! Any idea on what to substitute as I cannot have sucralose or stevia? Any other sweeteners substitutes? You could use all xylitol and/or erythritol without the stevia. You will need to increase the amount. If I use erythritol only what amount do I need to increase to? Up to twice as much. I'd try 3/4 cup and taste the batter. You can always add a little more. I store all my low carb baked goods in the fridge. But these should be fine at room temperature for a couple days if you'd prefer that. They do freeze well too. 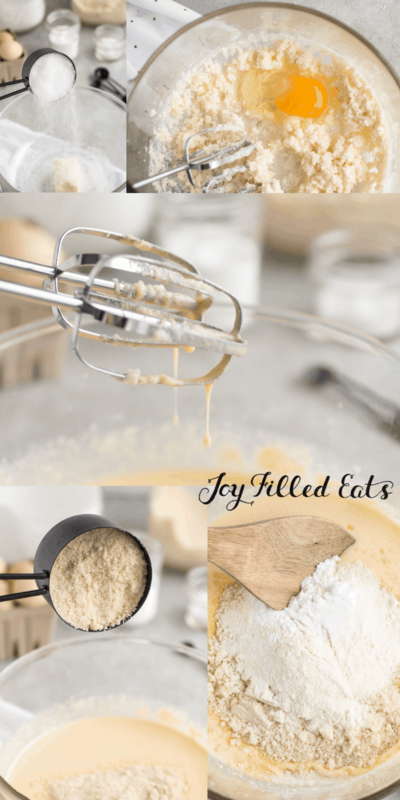 Absolutely delish!...I've made this recipe twice in the last week and both times instead of using the batter for cupcakes I poured it into a cake pan. Thought the batter may be to much to raise but had no problem at all with baking it. I made a cream cheese frosting for it. No one knew it was sugar free and keto!! Will def be using this again and again! Would you mind sharing what size cake pan you use? And do you need the same baking time? Thanks for sharing. I was thinking of doing the same thing. It’s my sons birthday and I’ve been Keto for 3 months so I shouldn’t have regular birthday cake. I made these for me and they are sooo good. I like them without frosting. This will be my go to recipe. Thanks! My Birthday tomorrow and I was craving cake. So make these today. Very tasty - could use a bit more Vanilla or some other sort of flavouring. Only needed 20 minutes to bake these - good thing I checked. Used cream cheese and Swerve Icing sugar and more vanilla for the icing. Will definitely make these again. Yum Thanks for the recipe. I made the cupcakes and it came out sooooo good! I reduced the sugar substitute quantity cos I don't like my cake too sweet, it taste so good. Am few weeks pregnant and these cupcakes come handy, very filling too. Thank you! Just made these with my daughter and half of the cupcake got stuck to the cupcake cup. I think next time I'm going to only cook them for 25 minutes. Try using parchment cupcake liners. Nothing sticks. I love those! Bought them on amazon. Thank you! Will try that... I've also started cooking them less time and that helped a little. Can I use super sweet? That's all I have but, I don't want to ruin them. I think so but I can't guarantee it since I haven't tried. They should be ok without the bulk of the gentle sweet. I have THM baking blend. How much would I use for this to make it work? A little bit less than the flours called for. OMG! This review is long overdue. I have really missed cake since going low carb and now I don't have to. I have made these cupcakes at least 10 times and they are fabulous. I used Splenda (personal preference) and sugar free store bought icing(yes lazy) but have adapted to make not only chocolate icing but strawberry too. Took sugar free vanilla icing and mixed with cream cheese and sugar free strawberry preserves. Also filled middle with preserves. Only needed 15 min in oven but perfect every time and love that recipe only make 12 cupcakes. They freeze fully iced beautifully and only have to sit about 15 minutes before devouring in an emergency craving situation. Even serious anti low carbers love this recipe. Thank you for this awesome recipe! 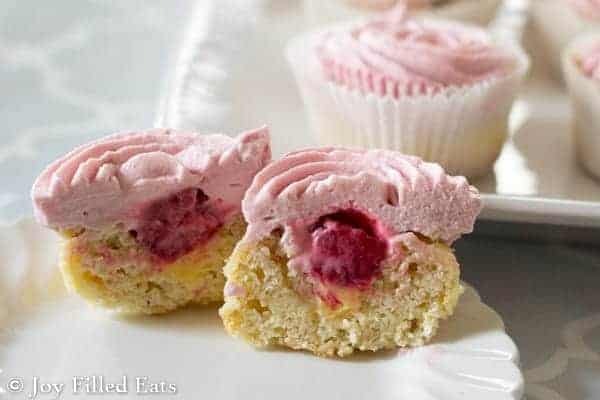 i really want to make these protein cupcakes, any idea if i need to adjust the flours if i add a couple scoops of vanilla protein? No, I'm sorry but I do not. I've never baked using protein powder. If you find another recipe that is similar that uses protein powder I'm happy to help you try to convert this one. I made this today and it is really good. Thanks for sharing this recipe. Quick question... What would be the THM serving size for this cupcake? Hi Maria, if you iced the cupcakes a serving would probably be one. If you didn't ice them and ate them plain or with berries you could probably get away with eating two. I'm not an expert on servings though. Thank you. I am eating them plain. Could I use THM baking blend in place of the flours? If so how much? Please.. It should sub in 1:1. I don't track those. You can find out pretty easily by putting the ingredients into an app or website like my fitness pal. There are some thm sweetener conversion charts on Pinterest. I would look over there. Good luck! 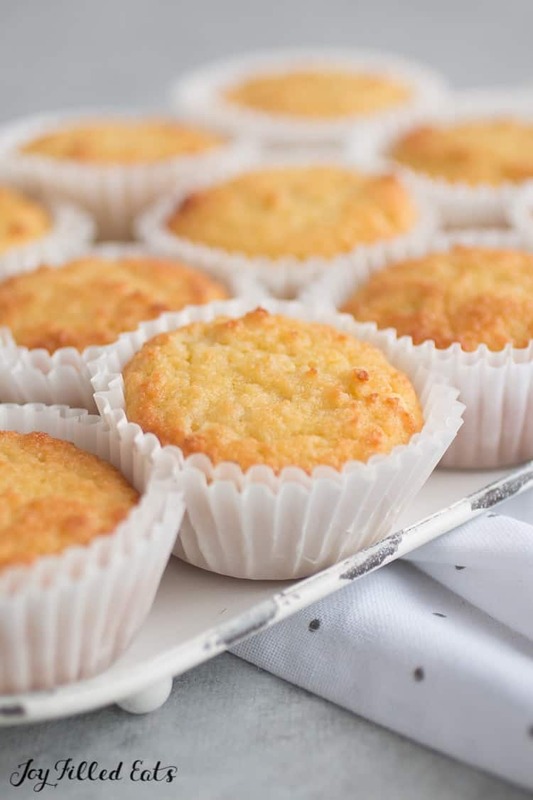 I added 1 teaspoon of almond flavor to this recipe to make an THM on-plan coconut frosted birthday cake and these are amazing! Thanks for another great recipe! Yes! They should be interchangeable. I use either in my favorite muffin in a mug recipe depending on what I have on hand. What temperature do you bake them at and how long? Sorry! Thanks for catching that. I'll edit it now. Bake at 350 for 30-35 min.